↑ "विदेश मंत्री सुषमा स्वराज ने कहा भारत पाक आपसी वार्ता के लिये तैयार [Foreign Minister Sushma Swaraj says India pak ready to composite talks]". Jagran.com. अभिगमन तिथि 10 मई 2018. ↑ "Sushma Swaraj". Encyclopædia Britannica. ↑ "The push for a Swaraj party". Tehelka. अभिगमन तिथि 19 December 2013. ↑ "Indian FM Sushma Swaraj's parents hailed from Lahore – Pakistan – Dunya News". dunyanews.tv. Dunya News. अभिगमन तिथि 18 December 2015. ↑ अ आ इ ई उ ऊ ए ऐ ओ औ "ब्यौरेवार प्रोफ़ाइल - श्रीमती सुषमा स्वराज - संसद सदस्य [Detailed Profile – Smt. Sushma Swaraj – Members of Parliament (Lok Sabha) – Who's Who – Government]: भारत का राष्ट्रीय पोर्टल" (अंग्रेज़ी में). India.gov.in. अभिगमन तिथि 27 अप्रैल 2014. ↑ "A sneak peek into Sushma Swaraj's life". Dainik Bhaskar. 28 March 2013. अभिगमन तिथि 27 April 2014. ↑ "Sushma Swaraj re-invents herself in a party dominated by Narendra Modi". The Economic Times. 25 February 2014. अभिगमन तिथि 27 April 2014. ↑ Archis Mohan (27 December 2015). "How Sushma Swaraj helped Modi get his Pak groove back". Business Standard. ↑ "Compendium of General Elections to Vidhan Sabha (1967–2009) in Haryana State" (PDF). NIC. अभिगमन तिथि 27 April 2014. ↑  Archived 29 सितंबर 2012 at the वेबैक मशीन. ↑ "Advani quits as Leader of Opposition". अभिगमन तिथि 18 December 2009. ↑ "New India opposition leader named". BBC News. 18 December 2009. अभिगमन तिथि 27 April 2014. ↑ "Lok Sabha". NIC. मूल से 21 May 2014 को पुरालेखित. अभिगमन तिथि 27 April 2014. ↑ "BJP gets majority alone". Sahara Samay. 16 May 2014. अभिगमन तिथि 20 May 2014. 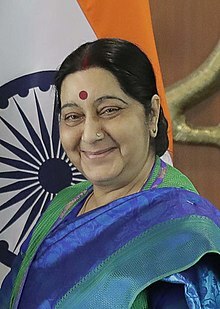 ↑ "सुषमा स्वराज बायुग्राफ़ी [Sushma Swaraj Biography]" (अंग्रेज़ी में). ↑ "A sneak peek into Sushma Swaraj's life" [सुषमा स्वराज की जिंदगी में चुपके से ताकझाँक] (अंग्रेज़ी में). Dainik Bhaskar. 28 मार्च 2013. अभिगमन तिथि 28 मई 2014. ↑ "Sushma Swaraj re-invents herself in a party dominated by Narendra Modi" [सुषमा स्वराज नरेंद्र मोदी के प्रभुत्व वाली पार्टी में आमंत्रित] (अंग्रेज़ी में). दि इकॉनोमिक टाइम्स. 25 फ़रवरी 2014. अभिगमन तिथि 28 मई 2014. ↑ Detailed Profile – – Members of Parliament (Rajya Sabha) – Who's Who – Government: National Portal of India. India.gov.in. Retrieved 30 July 2011. Archived 17 फ़रवरी 2012 at the वेबैक मशीन.